Sometimes when speaking about research skills and the importance of information literacy, things can seem a bit…ethereal. As if they were sort of ideas floating around, but no actions. That is decidedly not true. Please allow me to demonstrate with a research project of my own: Meringue. Once upon a time, I wanted to make a meringue pie. I knew that this is a notoriously difficult task for experienced cooks, but I wanted it to be good the first time. In fact, I wanted it to be perfect the first time. I wanted to eat a perfect meringue made by myself. So I did some research! Here are the basic steps taken during a research project. I took each of these steps, and as is usual, I sometimes had to circle back to a previous step on my journey. I’ll go through them one by one to show how I created my perfect meringue recipe. At the end, I’ll share my recipe with you. 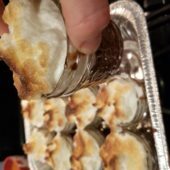 I knew that meringue was made of egg whites, involved whipping them with an electric mixer or whisk, and that I liked to eat it on pie. I knew that it could be made to look very swirly swoopy. That’s pretty much all I knew going in. My first couple of stops taught me that there are different types of meringue! Who knew? Here is an overview of the three different types from Cook’s Illustrated: What’s the Difference Between French, Swiss, and Italian Meringues? Now I had a new question: Which type should I learn to make? Some further delving taught me that while French meringue is most simple type to make, simply whipping eggs and adding sugar, it is also the least stable. Least stable did not seem like a recipe for success, if I was to make the perfect meringue without practice. Swiss meringue is denser than the rest, and no one recommended its use in pies. That left Italian meringue, which while not simple is the most stable variation. It is the lest likely to fall, or weep, or any of the other things people who make meringue worry about. Onward! My preliminary research allowed me to focus and refine my question: How is the perfect Italian meringue made? Q: What is “simple syrup?” A: Water with sugar melted into it. Q: What is “soft ball stage?” A: This is a candying term, and means when the temperature has reached a point at which the mixture when dripped into cold water will form a soft ball. This occurs at 238°F. Q: “How much further whipping?” A: Until when you take the whisk out of hte egg whites it forms a peak that does not fall in on itself at all. A separate line of inquiry was what the main pitfalls were and how to avoid them. 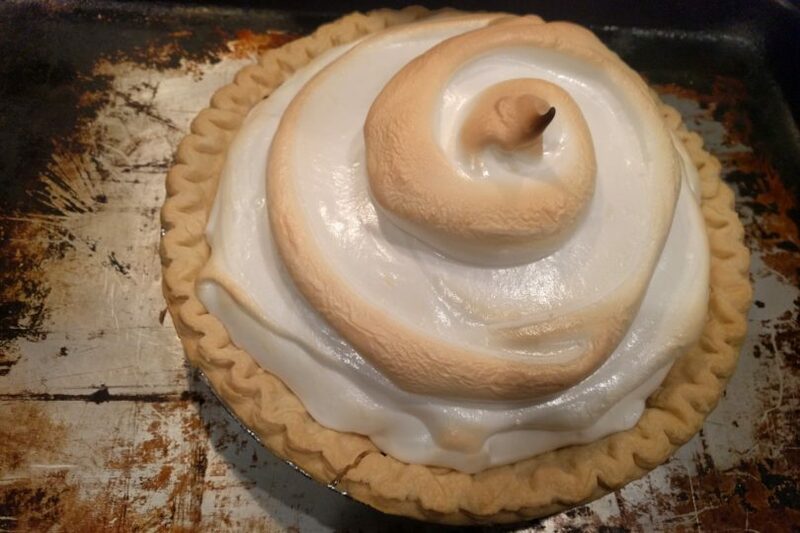 The two primary concerns with a meringue is that it will weep, meaning that droplets of liquid form on the surface, or that it will fall, meaning that it loses its height. I learned that acidity will keep a meringue from falling, thus cream of tartar or lemon juice can help, and that cornstarch can prevent weeping. Now that all the information was compiled, I got to apply it to life – make a meringue! Full disclosure, I actually did not get it right the very first time. There was one pitfall I had not known to avoid, and that was over-whipping. As it turns out, it is possible to whip your egg whites too much, causing them to lose their structure. The second time, my meringue was perfect. And now, if you follow the recipe below exactly as it is written, you can create a perfect meringue pie with no practice! Just make sure to invite your most skeptical skeptics over to eat it, or they won’t believe you did it. In a small saucepan, combine sugar and water. Heat over high heat, making sure to stir so no grains of sugar are stuck to the sides. Cook until sugar syrup registers 238°F on an instant read or candy thermometer. Meanwhile, combine egg whites, cream of tartar, corn starch. Set mixer to medium speed and mix until soft peaks form (when lifted, the head of the mixer should form gentle peaks in the egg whites that very slowly collapse back into themselves), 2-4 minutes. When the syrup reaches 238°F, transfer to another container so it stops heating. Preferably something with a spout. With the mixer running on low, carefully and slowly drizzle hot syrup into egg whites. Increase mixer speed to high and whip until firm and glossy. Don’t over whip – stop when they are glossy. While the pie crust is baking, make the custard. (Lemon custard is traditional, chocolate custard is also delicious. Look for a custard recipe that uses 4 egg yolks, so you can use the yolks from the eggs you used ot make the meringue. Make meringue after the custard is finishedand in the pie crust. Spread meringue over top, sealing the edges. Use your spatula to create a design in the meringue. A spiral is traditional. Bake at 450 for 5-10 min, until the top is slightly browned.